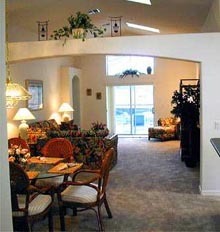 Orlando's Finest has Fantastic Vacation Homes & Condos Just Right for You and Your Family! Take a look at some of our outstanding homes, this is a small example of over 200 homes we have to offer. Your vacation home will be just as nice as what you see here. Please remember, with 200 homes under management, you may or may not receive the home that is pictured here. What you will get is a home that is just as nice as what you see here ! If you are not satisfied with your home, just let us know and we will make it right. We take great pride in our homes, we want you to see that. Our homes are so well equipped it is difficult to list it all. All our homes have a private enclosed pool for your use. All linens and towels are provided. Cable TV, VCR and a stereo system. The kitchen has a refrigerator, stove, oven, dishwasher, microwave, toaster, coffee maker and blender. Also included are dishes and utensils, pots and pans. There is a two car garage for your use. Also you will find a washer and dryer, ironing board, vacuum cleaner and even a hair dryer. What more can you ask for? Every home is beautifully furnished, fully equipped and professionally cleaned ready for your arrival. Clean sheets are on the bed and fresh towels are provided. Our homes are fully licensed and equipped with smoke detectors, emergency lighting and fire extinguishers. Orlando's Finest Vacation Homes, where we provide everything. Despite the high quality of our homes, the rental rates are very attractive when you compare them to hotel accommodations. We offer more comfort, space and convenience. This proves to be an exceptional value for your vacation dollar. Rates vary depending on size of home, season and length of stay, please inquire. Inquire about pet friendly and game room homes.